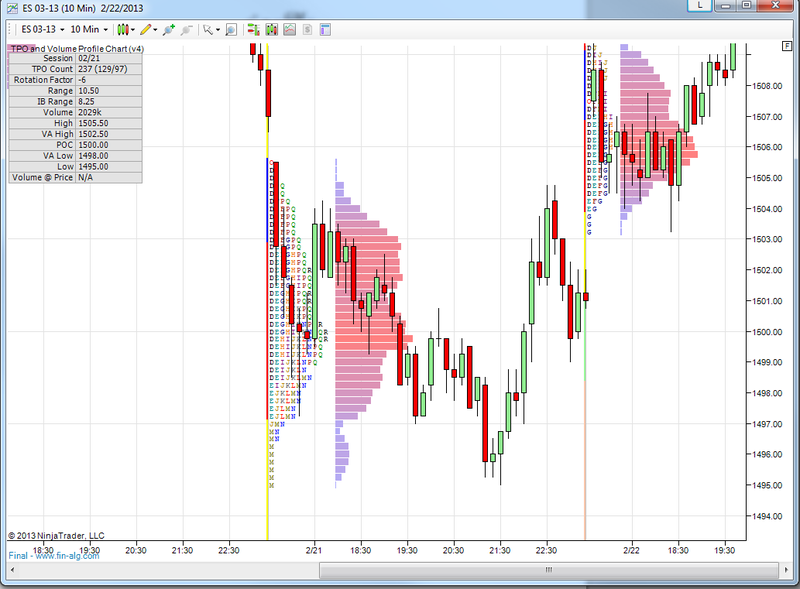 How to Install the TPOChart indicator? Add the indicator (Ctrl-I), should be at the top of the indicator list. 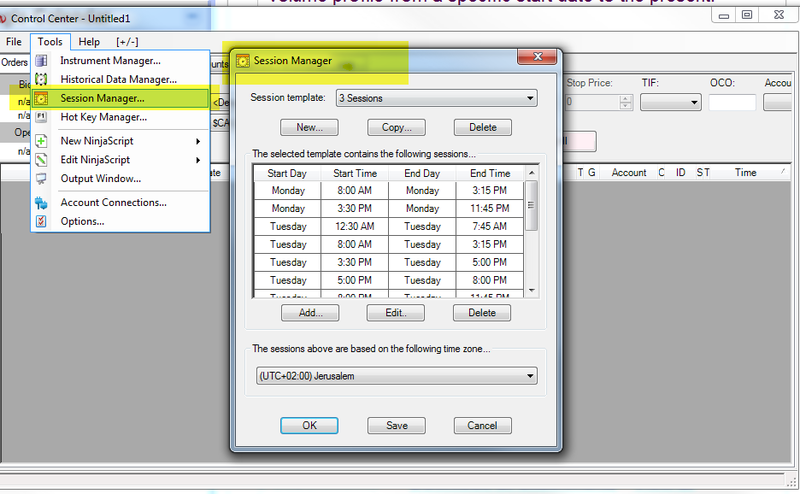 To configure the session times and optionally split the profile for day and night session, use the new NT7 session manager to configure the sessions times. 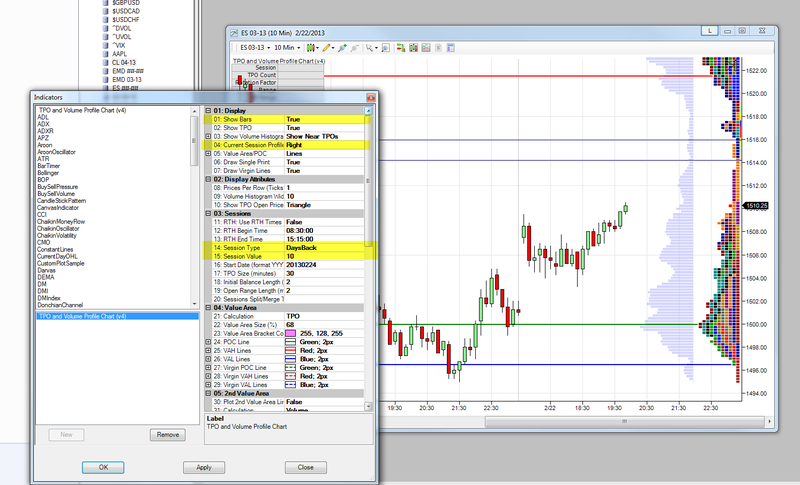 To test this open a normal 10 min chart, make sure you get the correct sessions, The add the TPOChart indicator to the chart and set Show Bars = True so you can see the exact bars of each session. 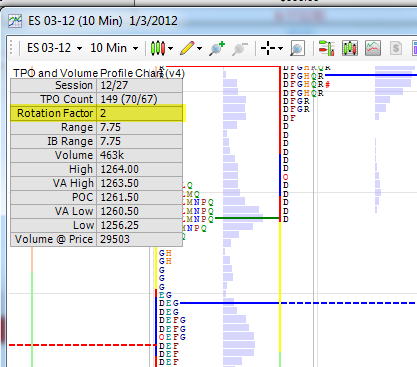 How to turn off the TPO display and only have the Volume profile on the charts? How to display a profile for specific date range? How to scale the graphic/scroll vertically? To resize you can click on the right side price panel and drag to change the scale. A box with an "F" (Fixed) will appear in the upper right corner of the chart margin anytime the vertical chart axis is manually adjusted. 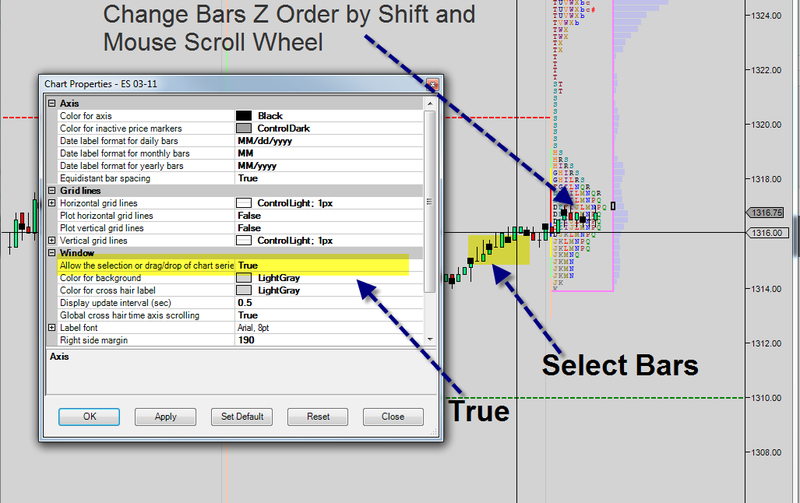 This signifies the chart axis is set to a "fixed" scale. Left mouse click this button to return to auto scale. 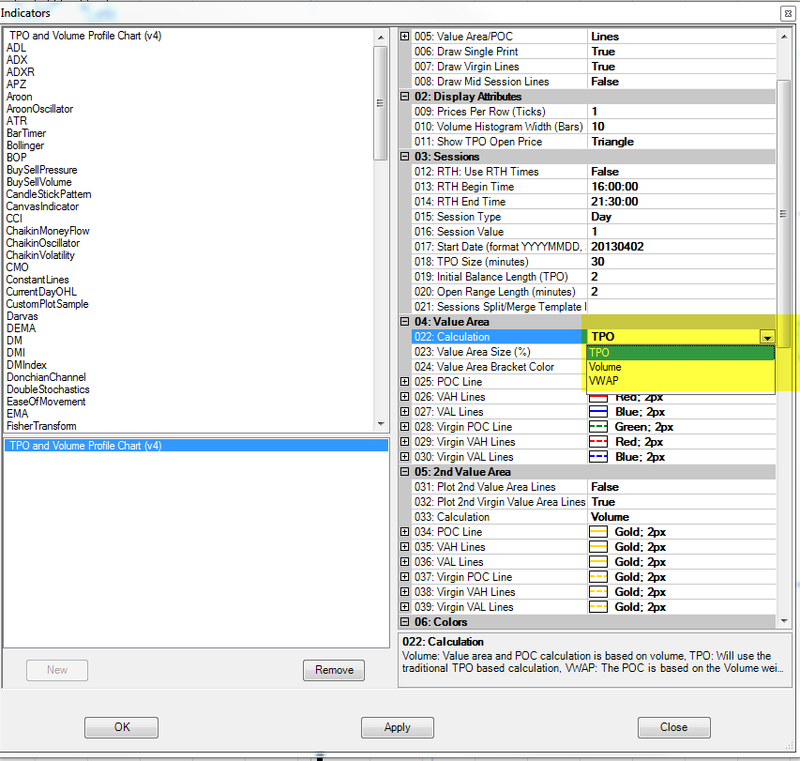 Also to control how many ticks each letter represent you can modify the value of "Prices per Row (Ticks)" try set it to 4 or 10 this can help to better fit the letters into the chart. 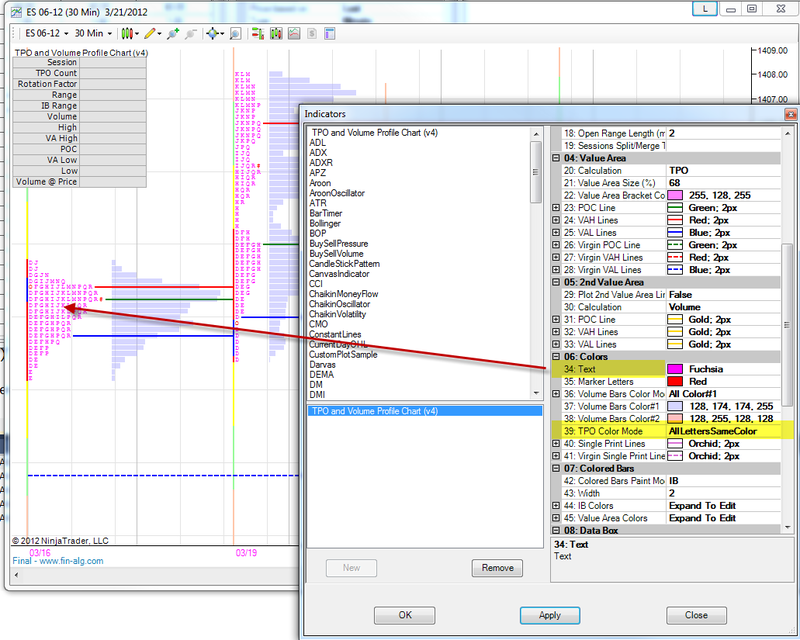 Set Value Area Calculation type to Volume, see image, if you want to show both you can use the "2nd Value Area" options. Some days data is missing, what can be done? Rotation Factor - Each letter is given a +1 if it&apos;s high is above high of previous letter, and a -1 if it&apos;s high is below high of previous letter. In addition, a +1 or -1 is added based on whether the low was above or below the previous low. Each letters RF (anywhere from -2 to +2) is summed to provide the RF of the profile. 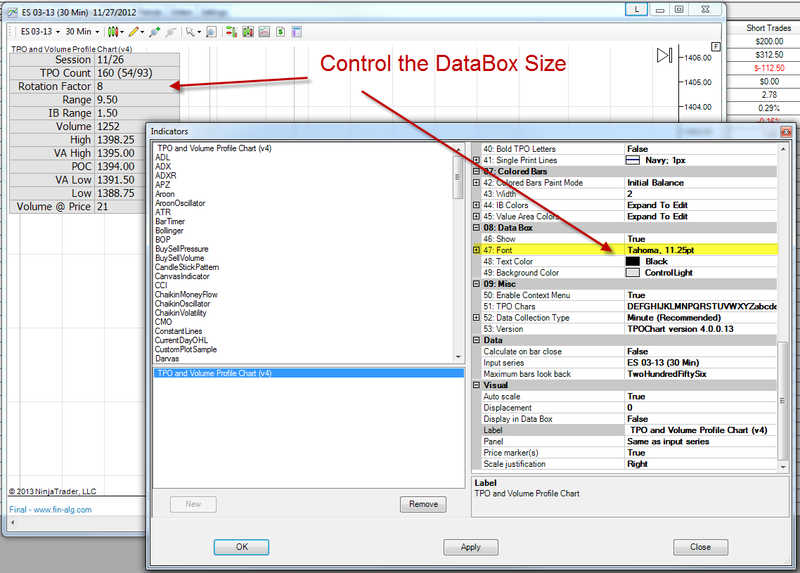 What is TPO Count numbers in the data box? Total number of letters, and in brackets, above /below the POC. Volume is based only on volume, take the price that has the largest volume and do up and down until 68% of the volume is included. 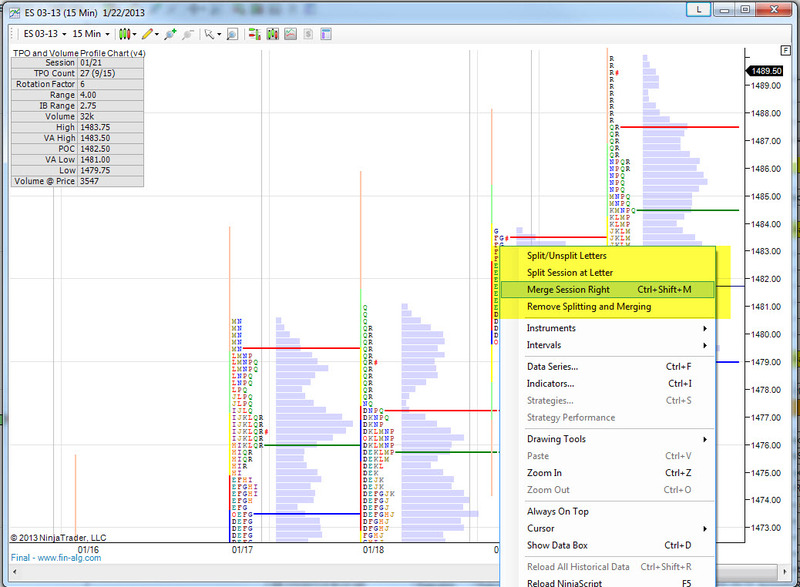 Initial Balance is drawn on bar to the left of the profile, usually you select 2 to draw the 1st trading hour range called initial balance (2 TPO = 60 min) some studies use it for support and resistance levels as well as 150% and 200% of this range. 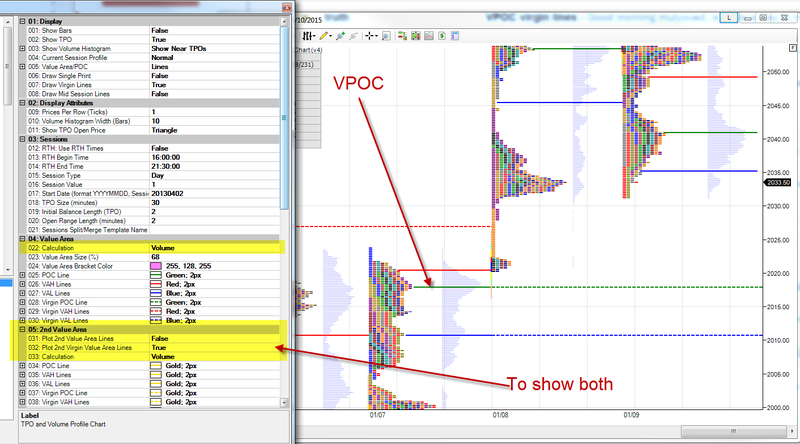 What is the idea and use behind the session split template on the TPO Indicator? What is HVN/LVN Sensitivity, how to use it? 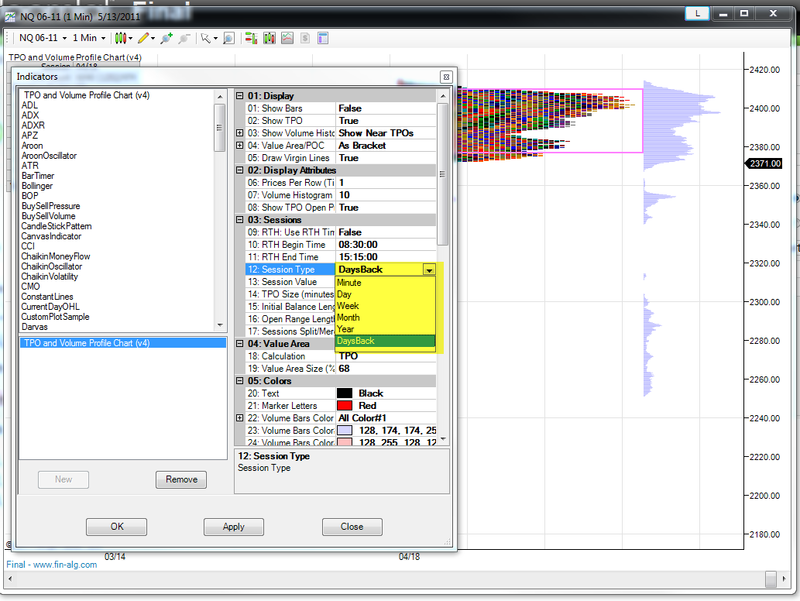 Say Sensitivity is 10, To qualify a price level to be HVN volume at price need to be higher then the volume of each of the 10 ticks above it and each of the 10 ticks below it. 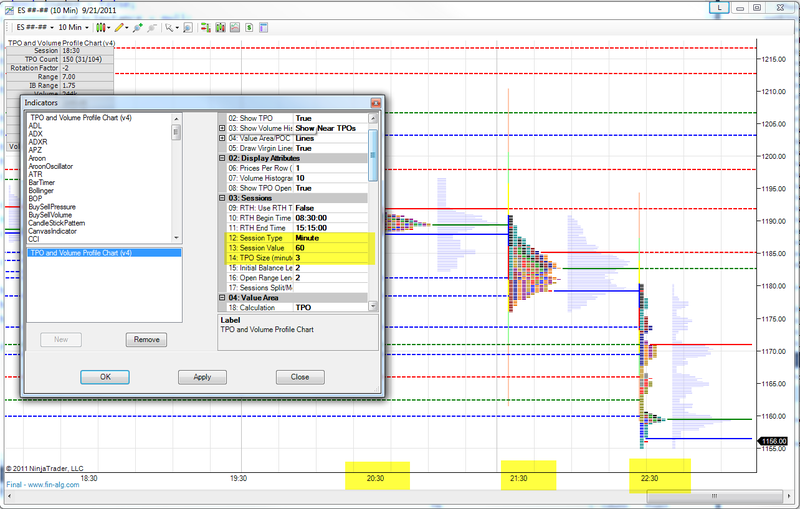 How do I configure for hourly profile and 3 min TPO Size? How to build a profile “from a start date”? 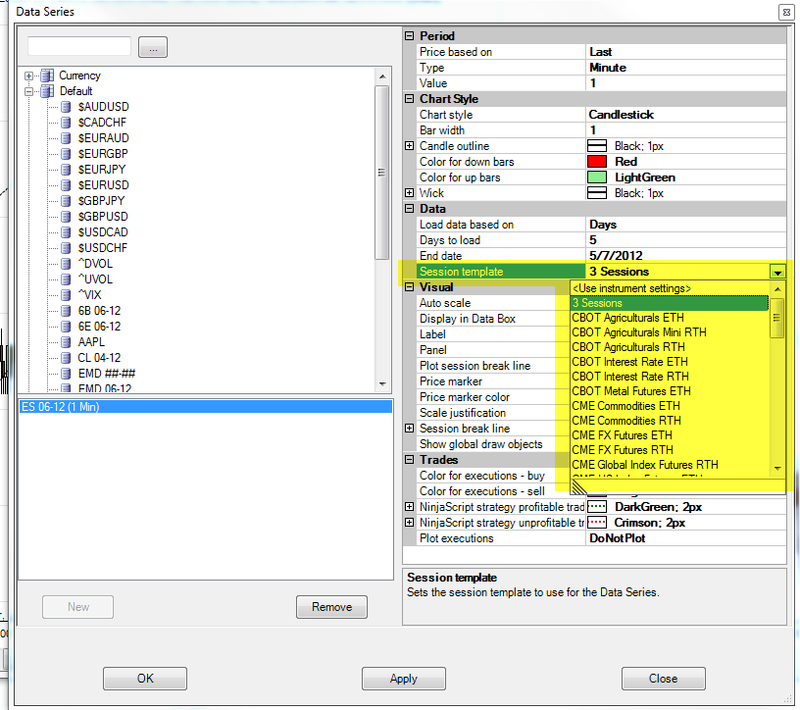 How to use with EOD (Daily) data? Will TPOChart will work with my data feed? What type of data is needed? What is "Use 1 tick data"? Where I can find the latest version? Can I can get notifications on new versions? How do I check which version I have? 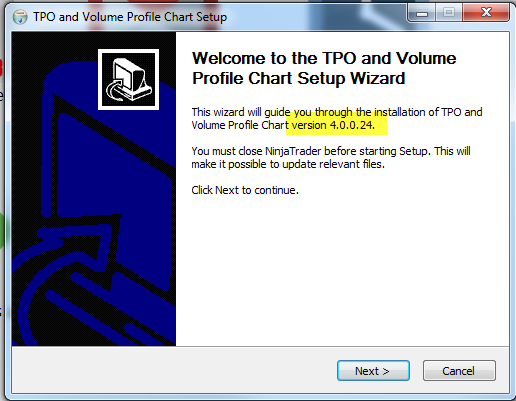 I have two PC can I install TPOChart on both using one license? If not exit NinjaTrader, make sure AntiVirus is disabled and run the installer again. 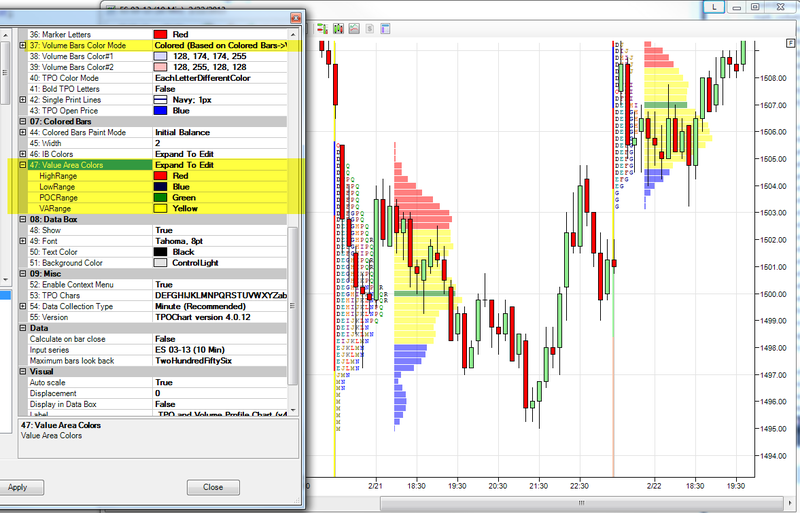 If still cannot find it check if the dll was installed under different user, users can be found under "C:\Users" and you should check each "C:\Users\[user]\Documents\NinjaTrader 7\bin\Custom" folder for the dll, in that case try to install again and make sure to install to the correct user or you can just copy the dll to the right user. 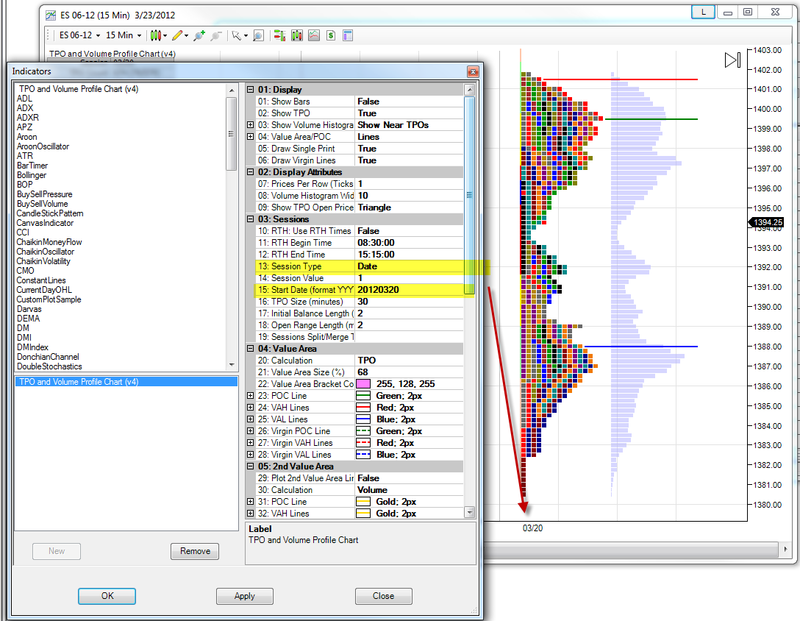 After starting NinjaTrader check the NinjaTrader log and make sure DLL was loaded correctly, look for a line that say "Vendor assembly &apos;Final.TPOChart&apos; version=&apos;4.0.0.22&apos; loaded"
Open the indicator list and look for " TPO and Volume Profile Chart (v4)", Notice it should be at the top of the list as there is a leading space to the name. 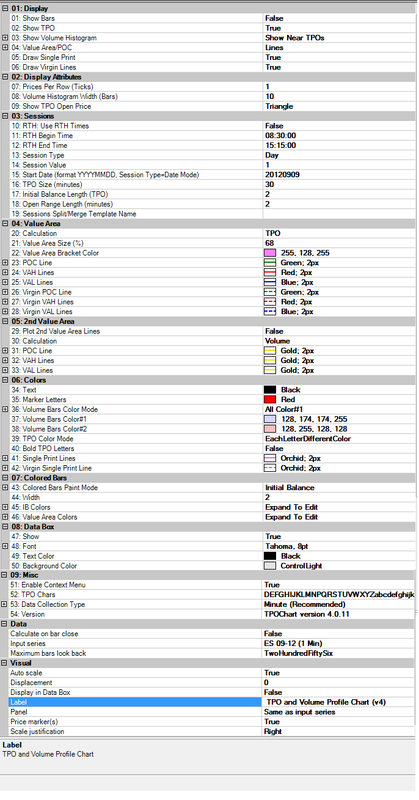 Can I see list of parameters? 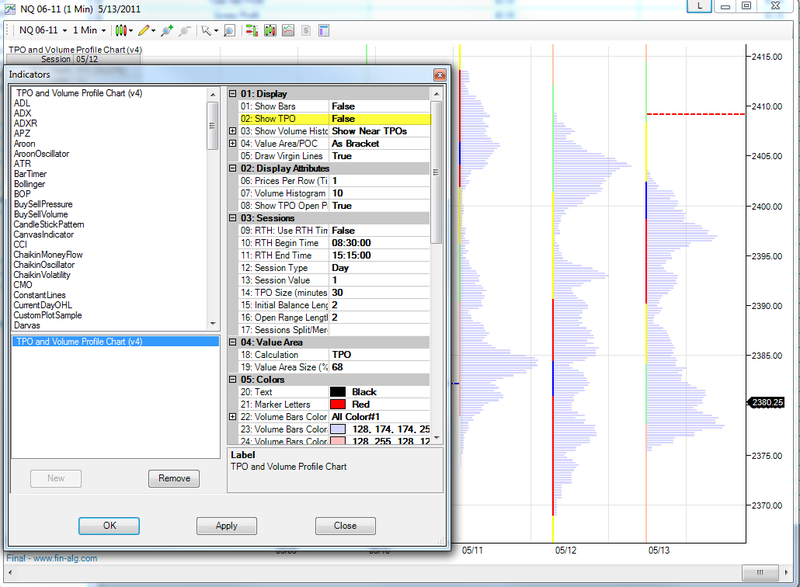 Do you have any suggestion or tutorial how to trade with TPOChart?